Is this barrel nitride or phosphate coated. Two of the three above references say nitride, one says phosphate. Which is it, please? Whats the inside diameter of the handguard? BEST ANSWER: 1 3/8's inch! Can’t they just answer this. I have same question. What is the model number of the Vortex Sparc AR red dot optic? does this have a adjustable gas block? Can anyone explain why it takes "up to 15 days" to ship an upper? Buy a lower, next day service. Buy mags, optics etc next day service. Do they store the uppers in carbonate and need to defrost them for human appplication? Are they cast in granite and need to be chiseled out by magical forest gnomes with special upper receiver hammers? BEST ANSWER: Ordered over a week ago, still hasn't shipped. they must be mining the metal or something it's mind boggling that it takes a company up to half a month to ship a product. I just ordered this package.. It shipped out the very next day. I ordered a 16" nitride upper about 3 months ago... It was also shipped the next day. What is a SBR stamp? I am new to building AR-15s but am very mechanically inclined & really want to custom build my own but sort of budget friendly lol. BEST ANSWER: It’s a "license" from the BATF. You need it if you put a upper under 16" on a AR lower. You don’t need it if you put a upper under 16" on a pistol lower. Do your homework and make sure you understand the rules before you start building. Would this be a good pistol barrel? BEST ANSWER: This is a good CQC upper. I have mine on a lower with the SBA3 brace that is always on sale and it is pretty great. How far does the flash can protrude from the end of the handguard? BEST ANSWER: It stands out from the top of the hand guard about 1 1/4 inches and 1 3/4 inches from the bottom. Will this upper fit a bushmaster 5.56 lower? Is the "mbus" sight set, that comes with this, plastic or metal ? I have seen both. BEST ANSWER: It is made of a polymer! Is this come with trigger group? BEST ANSWER: Nope. It is only the upper. The trigger group goes in the lower. Can’t you just tack weld one of those 5.5-6” faux “silencer” tubes onto the barrel and be compliant and look cool at the same time? Do the MBUS sights absolute or lower 1/3 co-witness with the Sparc optic? BEST ANSWER: The Sparc optic comes with a base plate riser that allows you to do either. Is this a kit or a complete upper assembly (minus BCG and CH)? BEST ANSWER: Complete upper minus BCG and charging handle. Is this considered pistol upper or SBR? BEST ANSWER: It’s intended for pistol build. Whether it’s a pistol or SBR depends on what type of lower brace or buttstock is on your lower receiver. If you have a Pistol brace on a standard lower then it’s considered a pistol. Hope that helps! Is this compatible with the mp sport 2 ar 15? 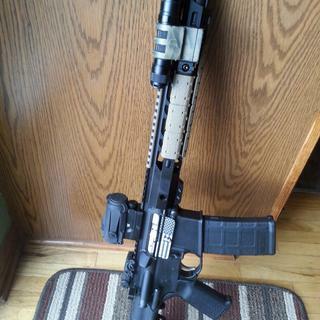 Does anyone have this on an Anderson lower? I was told it may need shimmed. How do I get this barrel but off to change the upper? After its shipped how long will it take? Will this work on a Bushmaster Lower? Is this or has this been offered in 300 Blackout? Will this fit with a S&W sport 2 lower and bolt carrier group? 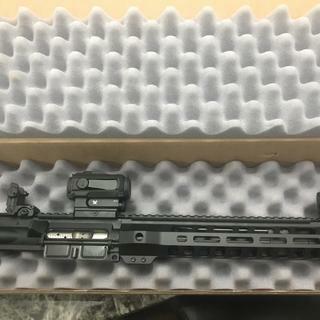 It'll function, but I'm more than likely not going to be ordering an upper from PSA again anytime in the near future. Finally received the upper yesterday and though I can say that it looks great, I have to say that it's going to need a different upper receiver because, as mentioned in a previous review, there is far too much play horizontally when paired up with any of my lowers. It's still a pretty decent deal and thankfully I have a few other stripped uppers on hand, but this definitely leaves a sour taste in my mouth when it comes to PSA. Nice, light upper assembly. I checked all the tolerances on it before i built it and it was spot on. Great deal with the Vortex Sparc. Its not the best red dot on the market by any stretch, but it will be fine for the majority. My wife got me this mostly for the Sparc AR, and that alone is worth 200$! The 10.5 inch upper is just the icing on the cake as it's definitely worth the 180$(?) extra. It came in a discreet box, very well packaged. There were a few blemishes on the upper, but lets be honest, these are meant to be used. Not just left in the corner and for show. So the marks aren't that big of a deal to me whatsoever. The Sparc was in a shrink wrapped box (Original box from manufacture). I did take the upper apart as I have heard about doing it just for the sake of making sure everything is OK. My ONLY issue was that the aluminium barrel nut had ZERO grease on it and that the barrel extension had none. But again, the type of person I am, that was NO ISSUE. I enjoy taking things apart and putting it back together and had fun doing it. They work flawlessly as of yet. Will update if anything goes South in the future. Just received mine in the mail. Matched up well with my lower and a bcg/ch i had laying around. No issues. Radian Raptor LT charging handle, that works flawlessly in two other upper receivers, binds in this one. Nice kit but the upper receiver that was included is sub standard, all other parts are excellent. Did not fit any of my lowers (4) without excessive movement. It was not the Aero receiver that came on my PSA 7.5 upper which fit perfect. Went to Cabela’s and bought a new Aero to replace, not such a good deal if the upper is unacceptable. Purchasers make sure you get the upper with the T marks, this poorly fitting upper does not have them. Just based upon initial impression without shooting it yet; it looks great. Perfect fit and finish. Pairs well with the PSA nib bcg and I replaced the stock flash can with a micro kak can to get a more flush look. Looking forward to shooting it soon. Sleek and Petite, yet bold and intimidating ! Fast shipping. Ordered it on 02/10, it shipped on 02/14, and arrived on 02/21. 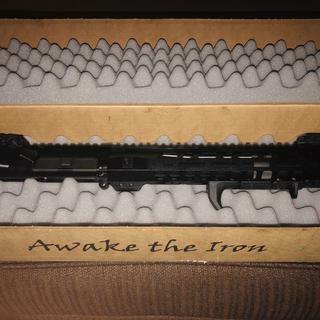 Purchased this based on Tactical Toolbox’s review. The pictures on this page don’t do the justice. Sleek and petite, yet bold and intimidating. Perfect finish and great quality for a reasonable price. Don’t pass up on such a great deal.